In 2012, the coalition government’s then Universities Minister, David Willetts, gave universities permission to triple tuition fees from £3,000 to £9,000 a year. 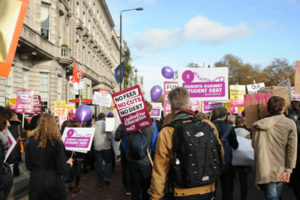 The government was keen to reassure young people that these much higher fees could be paid with “income-contingent” student loans, meaning that student debts built up while at university would not need to be paid back until after graduation when borrowers started to earn an income of more than £21,000. What was not so broadly advertised was that high rates of interest on the loans would be charged each month while a student was at university, and for the next 30 years after graduation, while repayments comprising an extra 9% “graduate tax” would be taken from monthly pay packets on top of National Insurance contributions of 12% and Basic Rate Income Tax of 20%. A young graduate’s effective tax rate would be a whopping 41%, a far cry from the “posh coffee a day” rhetoric from government ministers. The government’s calming tones continued: the current terms and conditions would not change they said, and the threshold would rise in line with inflation. Just two years later and using “secondary instruments” that did not need the prior approval of Parliament, the government reneged on their pledge, and froze the threshold at which repayment starts. This meant more low-earning graduates would be dragged into repayment more quickly. In the summer of 2016, and breaking yet another pledge, the government replaced maintenance grants, given to the poorest students, with maintenance loans, meaning that students from poorer backgrounds would have to borrow even more money in order to be able to afford to live away from home. This will add tens of thousands of pounds more debt to the average loans of those from poorer families. Furthermore, the amount students are able to borrow in the form of a student loan is now based on parental income, so that some students may have to depend more than they would want on their families to help cover their living costs. IF started to receive calls from worried parents, many of whom simply did not have enough money spare to help their children. Yet more parents contacted IF, desperately concerned about the huge amount of debt being placed on their children’s shoulders, and the subsequent stress felt by both parents and students. IF responded by establishing a new campaign called Parents Against Student Debt (PASD), run by parents calling for a fairer student deal. Since its launch on the autumn of 2016 we’ve been on the ITV Tonight Programme, on the BBC and in The Independent. We’ve put pressure on politicians and met with the NUS. There is still much more to do, but we will continue to challenge: the use of monthly compound interest in rapidly driving up student debt; the use of the Retail Price Index (RPI) as a form of measuring inflation; and how the imposition of an additional 3% interest on top of RPI can be justified in a era of record-low rates of interest charged on government borrowing. Parents are waking up to the debt their children face for 30 years and IF is working to help get them a fairer deal.